Labels is rated 4.2 out of 5 by 17. Make an impression by printing labels that are customized for your business. "We use the labels when mailing proposals out to clients, so it's very important that we have labels that look professional and represent our brand "look”… ordering on the website is simple and fast." Rated 5 out of 5 by Csc2019 from Good quality stickers Fast shipping. Inexpensive. And great quality. Would recommend. Rated 5 out of 5 by Huddlebert from Quality Product High quality product, delivered fast! Great website allowed me to create my own design. Will definitely use again. Rated 5 out of 5 by Hutyoasis from Love the look and feel! Easy to work with! The peeling of the backing is very easy! Rated 5 out of 5 by Kimberly from Quick delivery and easy set up We set them up in minutes and they were delivered quicker than expected! Uncoated custom labels make it easy to put your company name, logo or message on almost any surface. Whether you need product labels, shipping labels, labels for materials, or safety notices for manufacturing areas, we’ve got you covered. If you mail information to your clients or prospects, don’t overlook the importance of printing a branded label to make a professional impression. Print custom labels to carry over your marketing brand on mailing labels, shipping labels and return address labels. It’s also easy to print personalized labels to complete your stationery or business identity package, round out branding for an event, or even create your own adhesive gift tags. To create die cut labels or any custom order, give us a call or fill out our custom order form. Use our label layout templates to ensure your artwork is sized and formatted correctly. PrintPlace.com layout templates can be downloaded for each standard size label below, in an EPS, PDF, or JPG format for Illustrator or Photoshop. Your product and address labels are an important source of information for potential and current customers. To get the most impact out of your labels, use color. A consumer’s attention is easier to grab with full color graphics or power words in a different colored font. PrintPlace.com prints labels on uncoated paper stock which is also ideal for adhesive name tags, food labels or carton labels. Since our label stock is laser-safe, yours can be professionally printed at PrintPlace.com, and then personalized with specific names or products with your own laser printer. Just remember to design them using a compatible size. 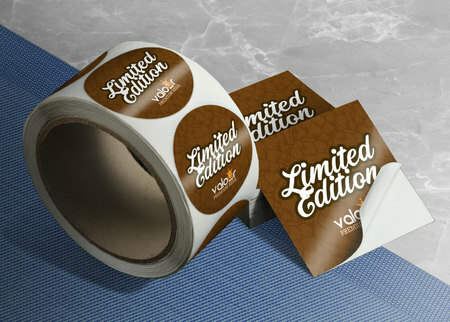 With quantities starting at 25, custom labels are also perfect for small or start-up health and beauty products, cake and pastry packaging, or adhesive gift tags. Larger custom labels are popular for use as adhesive signs or notices to be used in industrial or manufacturing areas, or as custom box or carton labels. Get your name or brand out there and make sure it sticks with custom labels.